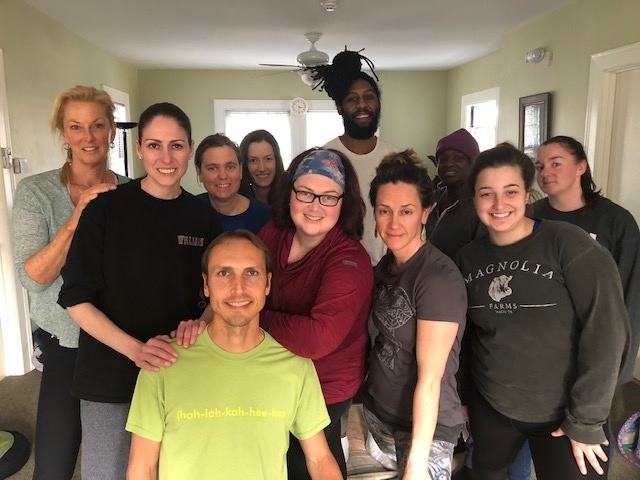 Slava's Thai Massage training courses are based on Slava's fifteen years of daily practice with clients of all walks of life, specializing in treatment and prevention of athletic injuries, chronic pain, and tension relief. These Thai massage courses are fully hands-on practicals and are designed to get participants to become comfortable with Thai massage to start working as Thai massage therapists and bodyworkers immediately after the training. After studying many systems of Thai Bodywork in the USA and in Thailand, Slava developed his own multiple Thai Massage sequences to address different tension and injury patterns in his clients that he had seen over the years. He eliminated certain bio-mechanics that may be harmful for practitioners, and added techniques that work in the most direct and effective way to treat specific health concerns and conditions. Part 3. Abdomen, Ribcage and Spine (10 CE hours). As a neuromuscular therapist, running coach, yoga therapist, and yoga anatomy teacher, Slava brings detailed knowledge of anatomy, physiology, kinesiology, and pathology into all of his training courses. At its core, Surya Thai Massage Training is about safe and efficient body mechanics for practitioners and effective treatment protocols for clients. "Slava's expertise and knowledge of thai bodywork, massage, and healing the athletic community has helped me in my bodywork practice after taking his course. I am thankful for his insightful tips of the trade you can't find in any book. You'll know he is an expert and passionate about his work as soon as you meet him, and it is an honor to have learned from him! ~ Celeste, 2016 Training"
"Slava is an exceptional teacher who shares his passion and expertise as he guides you through the dance and flow that is Thai Bodywork. Slava's class combines the best practices of therapeutic massage with the ancient wisdom and healing of Thai bodywork. Level one class will leave you with a very solid introduction and sequence that you can share with your family, friends or clients. I left this class feeling confident and ready to practice Thai Massage. I highly recommend Slava's classes for anyone who truly desires to learn and integrate this healing modality into their work. ~ Lisa M. 2017 Training"